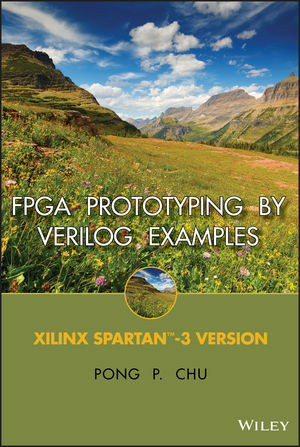 FPGA Prototyping Using Verilog Examples will provide you with a hands-on introduction to Verilog synthesis and FPGA programming through a “learn by doing” approach. By following the clear, easy-to-understand templates for code development and the numerous practical examples, you can quickly develop and simulate a sophisticated digital circuit, realize it on a prototyping device, and verify the operation of its physical implementation. This introductory text that will provide you with a solid foundation, instill confidence with rigorous examples for complex systems and prepare you for future development tasks. PONG P. CHU, PHD, is Associate Professor in the Department of Electrical and Computer Engineering at Cleveland State University in Ohio. He has taught undergraduate- and graduate-level digital systems and computer architecture courses for more than a decade and has received instructional grants from the National Science Foundation and Cleveland State University. PART I. BASIC DIGITAL CIRCUITS. 2. Overview of FPGA and EDA software. 7. Selected Topics of Verilog. 12. Xilinx Spartan-3 Specific Memory. 13. VGA controller I: graphic. 14. VGA controller II: text. PART III. PICOBLAZE MICROCONTROLLERXILINX SPECIFIC. 16. PicoBlaze Assembly Code Development. Appendix A: Sample Verilog templates. It contains a large number of practical examples to illustrate and reinforce the design concepts and techniques. All examples can be implemented and tested on a prototyping board. The codes provided follow strict design guidelines and prepare the reader for developing large, complex systems in the future. The book covers the design of all I/O modules of the Digilent Basys prototyping board and has prepared constraint files, project files, and configuration files. When used with this board, the book and board combo becomes a self-contained "turn-key" solution for introductory and advanced digital design experiments and projects.